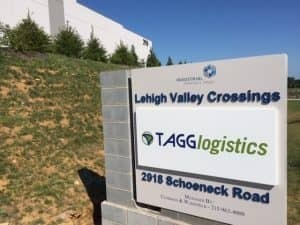 ST. LOUIS, MISSOURI, August 4, 2016… TAGG Logistics, the nationwide e-commerce fulfillment, retail distribution and logistics provider, has opened a second facility serving the East Coast, in Macungie, Pennsylvania. The newly constructed 106,000 square foot fulfillment center will supplement TAGG’s original East Coast location in Philadelphia and become the new operational hub in the region. The new facility is a leap forward in fulfillment technology, employing the latest innovations to improve efficiency and throughput for high-volume, direct-to-consumer clients. “These advancements are on par with any major, direct-to-consumer facility anywhere,” said Tod Yazdi, Principal. The Class A facility is rated ‘food grade’ by the U.S. Food and Drug Administration (FDA), so it is equipped to safely store and handle health and wellness products intended for human consumption. The facility is also compliant with other applicable FDA regulatory guidelines and good manufacturing practices (GMP). “Plus, we have our own processes to ensure quality throughout our operation,” Yazdi said. A key capability of the new fulfillment center is efficiently handling high-volume orders. Utilizing the latest advancements in technology and infrastructure, the facility is ideal for e-commerce retailers that need direct-to-consumer fulfillment seven days a week. The new Pennsylvania facility will deliver to Northeast destinations within one business day and to the entire East Coast within two. Combined with other fulfillment centers in St. Louis, Missouri and Reno, Nevada, the new location is helping to deliver on TAGG’s commitment to give direct-to-consumer companies fast and efficient access to their customers across the country. “It’s just one more way we’re delivering on our promise of Your Business EverywhereSM,” Yazdi said. by efficiently serving consumers when, where and how they shop today. TAGG helps deliver this brand experience for healthcare and consumer products companies via e-commerce order fulfillment, retail distribution services, contract packaging, reverse logistics and kitting and assembly. To learn more, visit www.tagglogistics.com or call 866-991-TAGG.